L/R Mestres Manoel Nogueira, Roberto Souto, Pequenina, Nielson Menão, Bartolomeu, Ramos and Luis Cardoso (kneeling) | DMC/Nucleo Rei Inca. Antônio Domingos Ramos was one of the first brothers of the União do Vegetal. 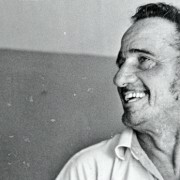 From Paraíba, He was born on September 5th, 1910 and set out in the 1950s to the then territory of Rondônia in search of better living conditions. Through the Umbanda circles in the capital Porto Velho, he meets José Gabriel da Costa and they become brothers in faith. 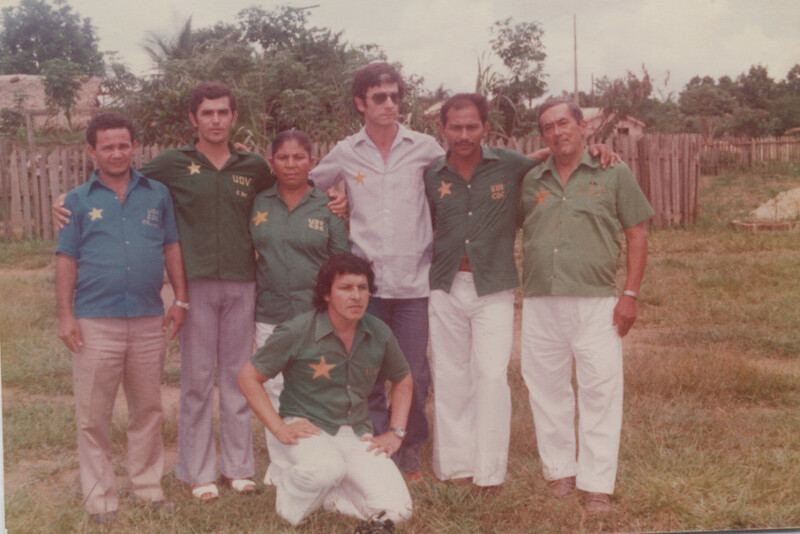 When Mestre Gabriel returns from the rubber plantations in 1965, bringing the União do Vegetal to Porto Velho, Ramos was one of the first people invited to participate in the sessions of the UDV that still occurred in the back of the headquarters for the Ciclo Esotérico da Comunhão do Pensamento (a secular organization for esoteric thought and meditation). He quickly became a disciple, participating actively in the new society created by Mestre Gabriel. In October of 1966, he became one of the first 1st disciples to receive the title of Mestre of the UDV in Porto Velho. The requirement for the first three approved (Santos, Modesto and Manoel Nogueira), Was that they open and close a session of the Vegetal and that they know how to bring a chamada of socorro (rescue). From the fourth onward, (Hilton Pereira Pinho, Florêncio Siqueira de Carvalho (Cruzeiro), Raimundo Carneiro Braga, José Luiz de Oliveira e Antônio Domingos Ramos), they would also have to tell the story of Hoasca. In the test, Ramos received the title of Mestre through Responsibility, a quality that he demonstrated during his walk in the UDV. 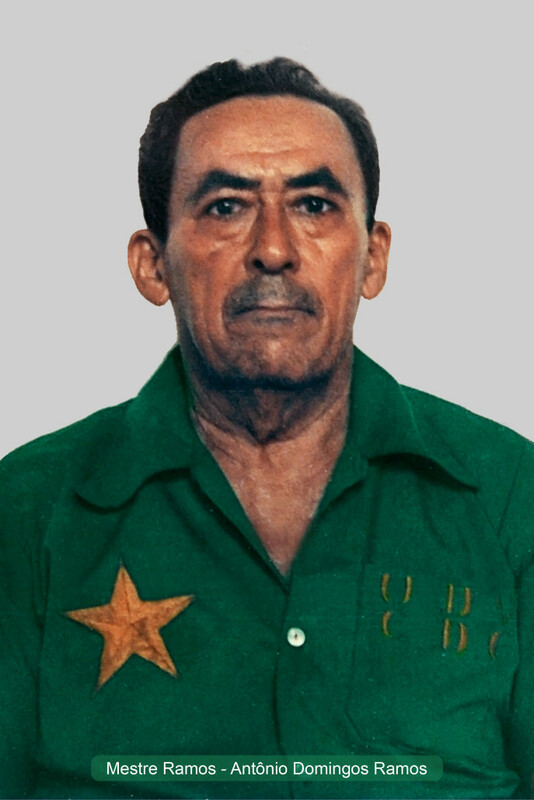 Mestre Ramos was the third counselor of the UDV and the first Mestre to receive the sash of the Assistant after Mestre Gabriel returned from Fortaleza (CE) in 1971. He was also the first Mestre of the Origin to disincarnate on December 19th, 1978, leaving little registry of his life and work. On June 26, 1980, Núcleo Mestre Ramos (Ariquemes, RO) was inaugurated; a just homage to one of the pioneers of the UDV. Click here and read the piece published in the UDV blog in homage of the 36 years of Núcleo Mestre Ramos. When he arrived in the União do Vegetal, Mestre Ramos worked as a merchant in the Central Market of Porto Velho. The market had 44 stalls distributed in a constructed area of 1405 m², and it was the largest commercial center in the city at the time. One day, in 1966, the market was destroyed by a mysterious fire. Thanks to the intuition of a friend, Mestre Ramos had removed his merchandise on the day before the disaster. The removed merchandise earned him sufficient resources to buy a farm and some heads of cattle and start his life again. So great was the lack of resources and difficulties faced at that time in Porto Velho that he was considered to be one of the “millionaires” of the city. However, of what he had, he always used it to assist in the work of the UDV. Among other things, Mestre Ramos, of his own initiative, financed the first mensagem (quest) for Mariri and the first preparation of tea (Preparo) in the capital of the then territory. Afterwards, he donated all the lumber for the construction of the roof of the old General Headquarters (today Núcleo Mestre Gabriel, the Historic Headquarters). He also had great appreciation for Mestre Gabriel, which he demonstrated in small deeds. From time to time, he would ask to borrow Mestre Gabriel’s truck for some activity, but he’d always return it with a full tank. Mestre Ramos, saw life in a different, poetic manner. The farm where he lived, he considered as his garden. To come and go to the garden, he and the family used the “gardener”, a Rural Willys pickup, one of the few vehicles in the city at that time. He married for the second time with Dulce Mota Ramos, but saw her as a flower and said she was his Rose (the name by which she became known by all). Together they had 5 daughters, whom he called his little birds. On the other hand, the little birds in his garden, he called his children. – How goes it, prince? – And the Kingdom, how goes it? Prospering? – So, my little birds, how are we doing? 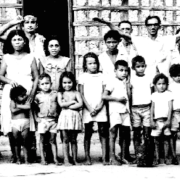 At the moment, the Department of Memory and Communication (DMC) of the General Directorate of the Beneficent Spiritist Center União do Vegetal is producing a documentary to preserve the history of Mestre Ramos together with Mestre Gabriel, to the first brothers and their beautiful families in Porto Velho, much different from those we know of today. The documentary will recognize and thank him for his responsibility in the UDV. Mestre Ramos assisted in planting, watering and fertilizing our Hoasca society in its first days, so that today we can admire and enjoy this beautiful garden. *Thiago Beraldo is Member of the Cadre of Mestres of the Nucleo Jardim Florescendo (Flórida – USA).